Microdermabrasion or skin polishing is a painless skin-care treatment that wipes off the surface layer of skin by using microcrystals. It's usually done to the face, neck and décolletage. It's important to know the structure of skin in order to understand how microdermabrasion works. Your skin consists of two main layers, the epidermis and the dermis. The epidermis is the outside layer of the skin, and the topmost layer of epidermis is called stratum corneum. The stratum corneum acts as a barrier between the outside world and the lower skin layers. It's a set of dead skin cells and home to minor imperfections and blemishes. Microdermabrasion takes place at the level of stratum corneum, removing the dead skin cells from the surface of epidermis and allowing the skin to breathe again. Microdermabrasion enhances the lymphatic and blood circulation in the skin and speeds up the production of new skin cells rich in collagen. Skin regains freshness and firmness, it becomes more lively and tauter. After removing the stratum corneum, skin can take more oxygen and nutrients due to its increased permeability, therefore special Guinot creams and lotions recommended for home treatment can be more effective because more of their active ingredients and moisture can find their way down to the lower layers of skin. Microdermabrasion can be applied throughout the year, in summer, however, using sunscreen spf50 is a must. Removing scars and pigments spots requires a cure of microdermabrasion, one treatment a week. Microdermabrasion face+oxygen treatment+ultra sound - duration: 30 min. Microdermabrasion face-neck-décolletage+oxygen treatment+ ultra sound - duration: 35 min. Microdermabrasion face+oxygen treatment+Guinot serum massage - duration: 40 min. 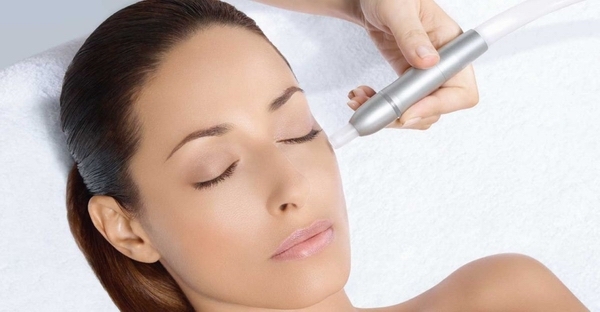 Microdermabrasion face-neck-décolletage+oxygen treatment+Guinot serum massage - duration: 45 min. Microdermabrasion face-neck-décolletage+oxygen treatment+Guinot anti-aging collagen gypsum mask - duration: 50 min. Microdermabrasion face-neck-décolletage+oxygen treatment+Guinot anti-aging aromatherapy rubber mask - duration: 50 min. Microdermabrasion face-neck-décolletage+oxygen treatment+Guinot brightening viatmin C mask - duration: 50 min. Microdermabrasion face-neck-décolletage+oxygen treatment+ hydrating needleless mesotherapy (meso sense) - duration: 60 min. Microdermabrasion face-neck-décolletage+oxygen treatment+hyaluron acid wrinkle filling with needleless mesotherapy (meso sense) - duration: 60 min.